Constructor taking only an error code. Constructor taking an error code and one argument. Constructor taking an error code and two arguments. Constructor taking an error code and three arguments. Return the error message as a C-string. The pointer returned by what() is valid only as long as the BasicError object exists. Simple error class used for exceptions. 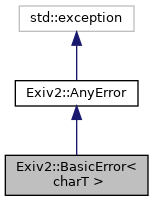 An output operator is provided to print errors to a stream.